The class of 2016 may know her as the girl who sang a piece of “Defying Gravity” from “Wicked” at last fall’s small group game show competition. Alisha Symington, a sophomore from Knoxville, Tenn., double-majoring in music and theatre, said she was caught a little by surprise with the performance. “I was like, ‘Oh, so this is the first time I’m going to sing in front of Cedarville University,’”she said. Although spontaneous, Symington’s game show performance would not be the only time she performed at Cedarville. 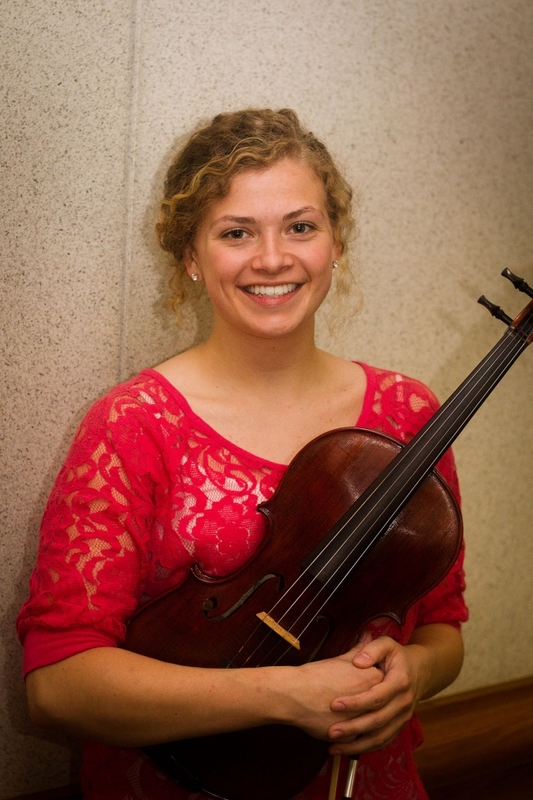 Over the course of Symington’s freshman year, she was involved in Concert Chorale, theatre productions, AYO, The Inversions and the orchestra at Grace Baptist Church in Cedarville. This year, she has added the jazz band and the orchestra to her list. Symington’s roommate, Victoria Boward, said Symington has been successful at taking on and trying things even upperclassmen have never done at one time. “She loves to do so much,” Boward said. Anna Zavodney, a fellow musician and actress of Symington’s, said every instrument Symington plays, she picks up easily. “I don’t think she realizes how much talent she has,” Zavodney said. And working hard is exactly what Symington has done. “Being a double major in theatre and music, it’s really hard to find opportunities to serve in a church or in the community,” Symington said. However, this ambitious musician has found ways to serve beyond the practice room, both before and during college. While preparing for one of six theatre productions she has been a part of the past few years at Oak Ridge Playhouse in Tennessee, Symington said she realized that God could use her right where she was, despite whether she thought he could. It was then that Symington realized what witnessing wasn’t. “I used to think that in order to be a witness, you had to preach in people’s faces all the time, [but now] I realize you don’t,” she said. Symington is also learning that by keeping the perspective that every one of her performances is to be for God’s glory, her involvement in the arts can be a service. Symington has further found that her involvement in the Grace Baptist Church orchestra has been a way for her to serve others. “At first I didn’t think it was that much of a service until I realized how much people appreciated it,” she said. Zavodney said Symington’s service goes much beyond her musical involvement and that Symington has been a huge blessing by just being a friend. Symington said she hopes to one day pursue ministering through music to an Ukrainian-speaking community. “I have been blessed with many opportunities,”she said. No Replies to "Student Spotlight - Student Witnesses Using the Arts"